320 pages | 21 B/W Illus. Ray Davies: Not Like Everybody Else is a critical biography of Ray Davies, with a focus on his music and his times. 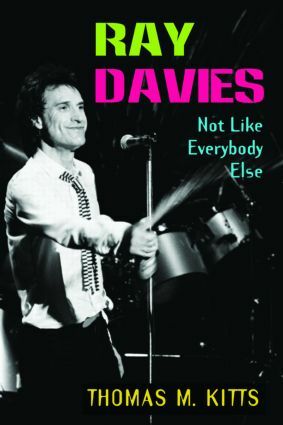 The book studies Davies’ work from the Kinks’ first singles through his 2006 solo album, from his rock musicals in the early 1970s to his one-man stage show in the 1990s, and from his films to his autobiography. Based on interviews with his closest associates, as well as studies of the recordings themselves, this book creates the most thorough picture of Davies’ work to date. Kitts situates Davies’ work in the context of the British Invasion and the growth of rock in the '60s and '70s, and in the larger context of English cultural history. For fans of rock music and the music of the Kinks, this book is a must have. It will finally place this legendary innovator in the pantheon of the great rock artists of the past half-century. Thomas M. Kitts, Professor of English and Chair of the Division of English/Speech at St. John’s University, NY, is the co-editor of Living on a Thin Line: Crossing Aesthetic Borders with The Kinks, the author of The Theatrical Life of George Henry Boker, articles on American literature and popular culture, reviews of books, CDs, and performances, and a play Gypsies. He is the book review editor of Popular Music and Society and the editor of The Mid-Atlantic Almanack.